In the midst of her shining performance at the 2012 London Olympics, the University of Georgia was Missy Franklin’s second preference right behind Cal. Nearly six years and plenty of races later, Franklin has changed her mind and will head to Athens. Franklin, a five-time gold medalist, has transferred from Cal to Georgia, where she will pursue a psychology degree in the classroom and a comeback in the pool. That one coach is the Bulldogs’ head swimming and diving coach Jack Bauerle, who coached Franklin when she made her first national team at age 13 and continued to keep in touch with her during her time at Cal. Aside from Bauerle and family, Franklin will be surrounded by fellow national team members Chase Kalisz, Melanie Margalis and Olivia Smoliga. In her two seasons with the Bears before she decided to turn professional, Franklin was far and away the squad’s best swimmer with a laundry list of achievements to her name. As a freshman, Franklin set a then-American record in the 200-yard freestyle with a time of 1:40.31 en route to an NCAA title. She capped off her inaugural season by winning Pac-12 Freshman of the Year, Pac-12 Swimmer of the Meet and the first of two team MVP awards. Franklin would claim that second team MVP award after another string of sensational showings in her second and final season with the Bears. The following season, Franklin led Cal to both Pac-12 and NCAA titles. At the NCAAs, Franklin won three individual titles, joining Natalie Coughlin as the only other swimmer in program history to achieve the feat. Franklin also propelled herself into the program’s record books every step of the way, finishing her season ranked in the top 10 of seven different events. As the cherry on top of her send-off season, Franklin would win NCAA Swimmer of the Year and Pac-12 Swimmer of the Year. 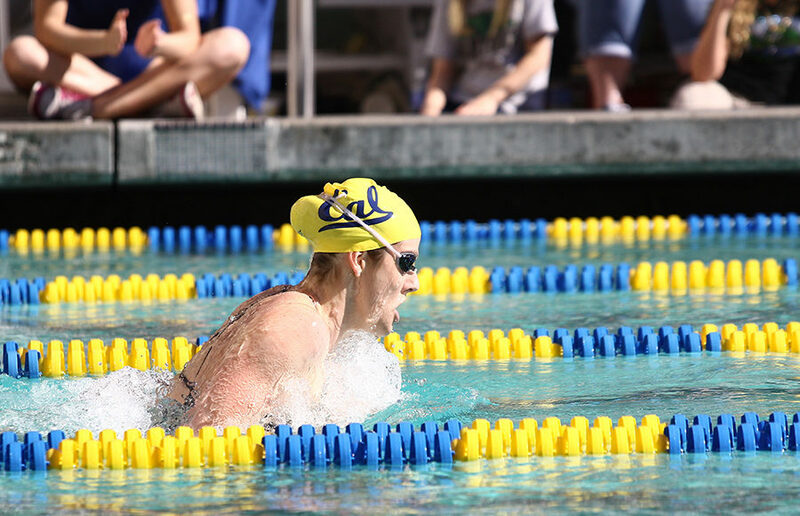 While she left Cal as one of the most dominant swimmers in the world, Franklin would fail to shock the world again in the same manner as her Olympic debut. Franklin described her second go-around on the big stage at the 2016 Rio Olympics as “disappointing,” after failing to qualify for the 200 freestyle and 200 back finals, as well as only swimming the preliminary heat of the 4×200 free relay, but not the final. A little less than a year later, Franklin underwent two shoulder surgeries after being diagnosed with bursitis in January 2017. The surgeries kept her out of major national and international competitions last summer, namely the U.S. Nationals and World Championships in Hungary. With a fresh start in Athens, Franklin is aiming to return to her dominant form. In the short term, Franklin’s main target is the U.S. Nationals in July. As for the future, Franklin is aiming for another date with destiny at the 2020 Tokyo Olympics.